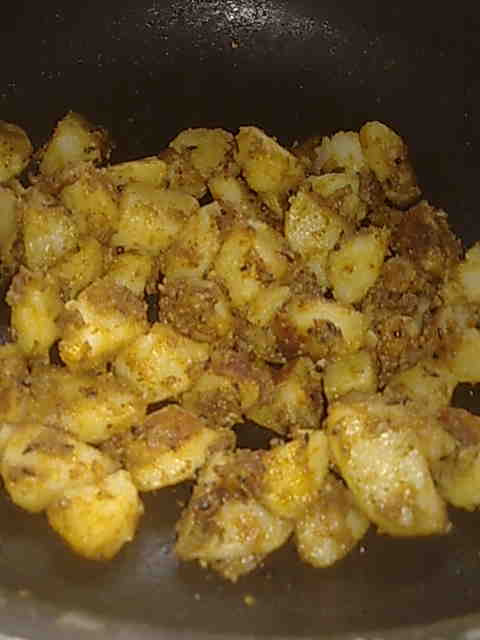 This is a very tasty recipe of masala aloo. While adding salt to aloo, please remember that chaat masala and masalas like sambar and pav bhaaji also contain some salt. If you don't have these masalas, you can also add any other masala of your choice. Feel free and experiment with ingredients. This is the fun of cooking guys! 1. Mix salt and all the spice powders with aloo. 2. Heat oil in a pan and add cumin seeds. 3. When they crackle, add spiced aloo. 4. Cook till aloo gets a roasted appearance, stirring occasionally. 5. Turn off heat and add lemon juice and mix gently. Serve hot masala aloo with some Indian bread or on their own.